This route is an agreeable stroll through the shady woods of Clot Mal, a stream that runs down from the western side of the slopes around the church of Freixe. You walk through two areas of box trees and cross Clot Mal twice, before coming to the permanent natural spring of Ca l’Espardenya. We are in signpost M3 Ermita del Freixe, where, just opposite, stands the small church of Santa Maria del Freixe. Pass in front of the church and pick up the path that takes you to a spring, Font del Freixe, which is currently being restored. Although this spring no longer flows, behind it there is a small pond that usually has water all year round. Continue past a small plant nursery. Continue downhill to signpost M4 Serrat del Verdaguer, where you should turn left to pick up another old mule trail once used by those who lived in the house Bustins to go to Mieres or to El Freixe. 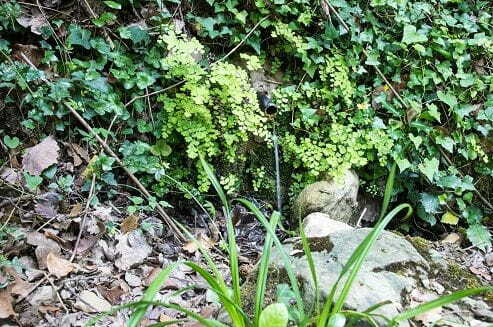 Pass through an attractive stand of box bushes and cross a gully, El Clot Mal. Despite being the main gully in the area and fed by a number of tributaries, you should be able to cross this stream without wetting your feet. Soon, you start to climb gently and then cross in quick succession two more streams, the first of which is El Torrent de la Font de Can Bac. Just before reaching another obvious gully, El Rec del Serrat Llobí, leave the mule trail and drop steeply down to the right along a narrower path that starts to zigzag down to a spring, La Font de Ca l’Espardenya, and a pond, La Bassa del Serrat Llobí. The spring usually flows all year round and the pond, always full, is a good place for amphibians who come to breed here and take shelter. In the past, when the houses and farms in the area were occupied, this pond was also used for washing clothes — half buried in the mud there are a number of large flat stones that the washerwomen from Ca l’Espardenya, El Masnou and Ca la Bruguera once used. Leave the pond along the path that descends northwards. Drop down for a while along a well-trod path that passes by a number of places carboneres, the places where piles of wood were once burnt to make charcoal. As you approach the stream, the amount of box bushes increases. In a shady area amidst a dense box thicket, you pass by another charcoal-burning site and cross Clot Mal once again. Follow the right bank of the stream and, after another charcoal-burning site, pick up a path that will soon take you into a sunnier, more open area and up to signpost M5 Camí Ral. This is the Royal Road that linked Sant Aniol and Mieres; turn right and the path begins to widen and turns into an old forest track. Continue along this track, always following the yellow Itinerànnia waymarking, until you come back to signpost M4 Serrat del Verdaguer. From here, retrace your steps to signpost M3 Ermita del Freixe, from where you should continue straight on towards ‘Mieres pel camí de les Marrades (1h25min)’.